© 1989 Duncan B. Gardiner, Ph.D., C.G. The building of a church was the ardent wish of the faithful. In 1820 Pastor-Dean Michael Fischl at the age of 59, came to Nitschkydorf. He was a very energetic man and we have him to thank that already in 1824 the long hoped-for church was built. Holy Mass was up to this point celebrated in the school, where there were unfortunately only two trees. The construction was begun by Anton Fleischer of Sanktandreas. The building foreman was Paul Schlauch from New Arad, (Palier?) was Augustin Reiber, mason Franz Kunst. Within 7 months the church was finished. The construction, of entirely new building material, was financed by the administration. The young people and especially the children of the village helped greatly with the building. 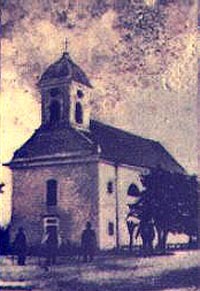 The form of the church can be seen on the attached picture, located after a long search. The roof was covered with shingles. Before the dedication the necessary furnishings were ready; Altar, tabernacle, pulpit, communion railing, and organ. Even a bell was available. The dedication was performed on 7 Nov 1824 by Dean Anton Csajkay of Rekasch because the bishop, due to his advanced age, could not come. As the procession arrived at the church, the key was given, with a short address to the celebrants, to acting building foreman Augustin Bergmann. On a small decorated table he put, together with a cross-decorated stone, a capsule with the charter which was blessed and walled into the foundation behind the altar. Pastor Dean Fischl held the celebration speech. The church, and the town, were dedicated to the Archangel Michael as patron saint. The townspeople felt great happiness and jubilation at finally, after 39 years, having a church in the village. The occasion is traditionally remembered, even today, as the greatest village holiday. After the dedication the first child was baptized. Pastor Dean Michael Fischl was the godfather. The child was christened Michael Wild. The church is 30 meters long, 13 meters wide with arched ceilings. The exterior of the church was completed only the next year, the reason for the doorway inscription of 1825. Beneath it is the inscription: Time Deum et Honora Regem (Fear God and honor the King). In the year 1911 the church burned to its walls, after which the roof was renovated and the bell tower was given the form it has today, apparently not so good looking as it was supposed to have been. The roof, as today, was covered with shingles. The pastor's happiness was short-lived; on 2 Sept 1827 his God greeted him in heaven. In remembrance and thanks to our ancestors we care for the church and will faithfully preserve what they have created. Extracted from the village chronicle of our townsman, Master Doctor Fr(anz?) Krauter, whom we keep in our thanks and thoughts. KONRAD MELLINGER and Helper, GEORG GRASZL, CHURCH ORGANIST, 20 SEPT 1987.